In 1961, Dave Brubeck told Ralph Gleason on the TV program Jazz Casual that jazz had lost some of its adventurous qualities. He said it wasn't challenging the public rhythmically the way it had in its early days. "It's time that the jazz musicians take up their original role of leading the public into a more adventurous rhythm," he said. Brubeck said it's a good idea to shake things up a bit, and that's exactly what he did with the song "Take Five." "Take Five" was the third track on the album Time Out, recorded in 1959. That was the year Miles Davis and Gil Evans introduced the jazz audience to modal music with the landmark album Kind of Blue, John Coltrane released Giant Steps and Art Farmer and Benny Golson formed their first jazztet. A lot of new things were happening in jazz in those days, but rhythmically, the music was still being played mostly in four-four time. Brubeck had always been interested in polyrhythm and polytonality. The first theory is what drives African music; the second is tied closely to classical. Brubeck had been playing in odd time signatures back in the late 1940s, but it wasn't until he returned from a trip to Turkey in 1958 that he thought about doing an entire album in different time signatures, like six-four, three-four, nine-eight and, in "Take Five," five-four. Brubeck's label at the time, Columbia, didn't know about his plans. When he finally let them in on what he was doing, the marketing department became nervous about releasing the album, and not just because of the strange meters. "I had a painting on the cover, and that hadn't happened in jazz," Brubeck said. "It may have happened in classical, I don't know. And also, it was all originals, and they were against that. If you did all original compositions, you usually couldn't do that. You just weren't allowed to do that. They wanted you to do standard Broadway shows and standard tunes from the love songs of the day or the hits of the day." Of course, it did get released in 1960, but only because then-label president Goddard Lieberson intervened. Lieberson really liked what Brubeck was doing. "I remember him saying, 'We don't need another copy of "Stardust" or "Body and Soul." We've got so many. And it's about time somebody did something like this." So instead of reworkings of jazz standards or tunes of the day, you got "Blue Rondo a la Turk," a song in nine-eight, as well as "Pick Up Sticks," "Strange Meadow Lark" and "Take Five." Much of the album was close to being worked out when Brubeck decided to add a tune in five-four time. "Dave used to feature me all the time for the drum solo," drummer Joe Morello says. "We'd close a concert with that because we'd get 'em standing and screaming and all of that. So I would go into five-four. The tune that I was working with Dave was 'Sounds of the Loop,' but on the drum-solo part, I'd just go into five-four and that's how that all started. So I kept asking Dave — I said, 'Why don't you write a song' — now he's the composer in the group, so finally Desmond said, 'I'll write something.'" Morello was referring to alto saxophonist Paul Desmond, who first played with Brubeck in the late 1940s before joining Brubeck's trio in 1951. Desmond is credited with composing "Take Five," but Brubeck says the tune was a group project with Desmond providing two main ideas. "Paul came in with two themes unrelated, and I put it together as a tune and made a form out of it," Brubeck says. "He came in with two themes. He didn't know which was the first or the second. He didn't know they'd fit together. Dopa, depa, depa, dopa, lom, bom, bom, bom. That's one theme. I'm the one that put them together and said, 'We can make a tune out of this. We repeat the first theme, and then you'd go to what we call a bridge, and then go back to the first theme, and then improvise on the one E flat minor chord change.' And then have a drum solo. Joe said, 'Dave, don't ever quit playing that vamp under my solo or I'll get lost.'" The quartet recorded the tune in two takes, and when it was done, Paul Desmond thought the song was a throwaway — so much so that he once joked about using his entire share of royalties from the song to buy a new electric shaver. 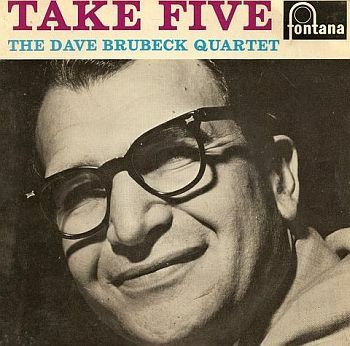 The title "Take Five" was Brubeck's idea; Desmond wasn't crazy about the title, but Brubeck persisted. "So I said, 'Well, we got to have a title. Why don't you want to use it?' And he said, 'Nobody knows what it means.' And I said, 'Paul, you're the only person probably in the country that doesn't know what it means." 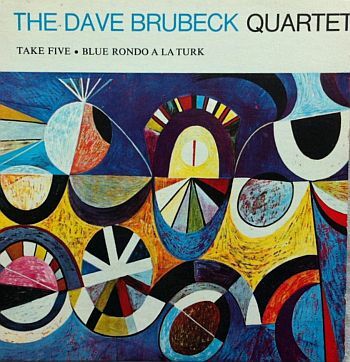 "Take Five" became the A side of a 45 record, Brubeck says, only because the other popular song "Blue Rondo a la Turk" was too long of a title for disc jockeys to say on the air. The album Time Out sold out almost immediately. Desmond once said the thing that made its title song work was the bridge. And it almost wasn't used. Both Brubeck and Morello say they can't pinpoint what it is about "Take Five" that has made it the biggest-selling jazz single ever. Brubeck guesses it was the catchy repeated vamp. Morello says the whole thing just clicked. "It just worked," he says. "You know, if anyone could ever predict what's going to be a big seller like that, my God, they'd be driving around in Rolls-Royces; you know, living in castles." "Take Five" spawned a number of jazz compositions in five-four time from lots of musicians, but you'd probably be hard-pressed to name any as memorable as "Take Five." It's a jazz standard in its own right. 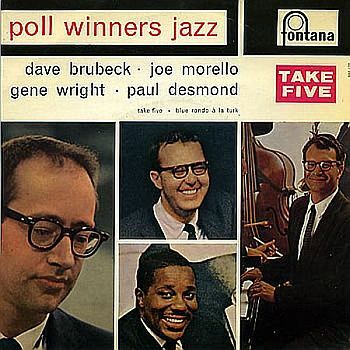 It is now a requisite for Dave Brubeck anytime he plays live, as well as Joe Morello. "Gene Krupa said to me one time — he said, 'That's your "Sing Sing Sing."' He said, 'That's the same thing.' He said, 'You're stuck with that one for the rest of your life,'" Morello says. "And I think he's right, but it's always a joy."